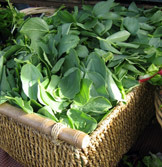 Fava greens look a little like young spinach, but the leaves are thicker, with a milder flavor. The leaves are sweeter and more tender early in the season, which lasts through the end of spring. They can be added to salads or cooked in pasta or eggs, like you would spinach.